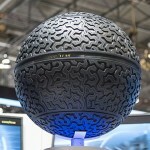 Futuristic tire technologies showcased at Geneva International Motor Show – Spherical-shaped Eagle-360 concept highlights maneuverability, connectivity – IntelliGrip concept’s advanced sensor technology could make vehicles even safer. © 2019 Tires24.com. All rights reserved. Theme by Solostream.